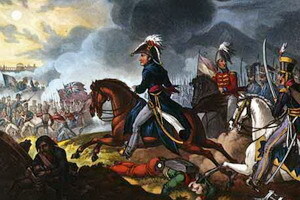 One of Wellington’s most important victories over the Napoleonic forces during the Peninsular campaign, the Battle of Salamanca in 1812 was essentially his first victory on the attack and served a great blow to French morale. Shortly after this led to the liberation of Madrid (albeit temporarily) from the rule of Napoleon’s brother Joseph. The battle was fought to the south west of the city of Salamanca amongst the hills known as the Arapiles which is unchanged today since the time of the battle.